At Lonmin’s annual general meeting yesterday, while protesters gathered outside, the London-listed company announced profits of US$100 million. It spoke of preserving its assets rather than investing in the company ahead of a takeover bid by the gold mining giant Sibanye-Stillwater. Lonmin executives urged shareholders to back the bid by the South African corporation, in a meeting that would have been focused on salvaging profit and shares, were it not for an alliance of Marikana solidarity groups present. Despite Lonmin’s improving financial performance, Beamish described Marikana as a “social project for housing and education, one which shareholders aren’t getting anything out of”. 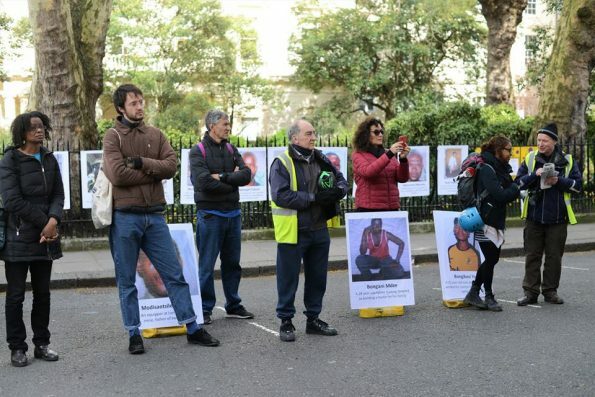 Members of the solidarity alliance responded by reminding Lonmin that it had accumulated vast profits from Marikana over decades – paying $607 million in dividends to its shareholders in the four years prior to the massacre and diverting $160 million to a tax haven in Bermuda – while failing to fulfill its legal obligations to provide its workers and the community with affordable housing and basic dignity. The takeover threatens 12,600 mine worker jobs, which Lonmin executives said could not be saved. As further discussion of the takeover was deferred until the company’s EGM, other questions from the alliance included ones about the community’s Social Labour Plan (SLP) (2), the unresolved issue of compensation for the widows of the Marikana massacre, and the company’s environmental record. Chair Brian Beamish was keen to shirk responsibility, blaming Marikana’s workers’ union AMCU for the takeover delay (AMCU has been striking for better pay at Sibanye-Stillwater’s gold operations since mid-November), and for the hold-up in building homes for the community. He also blamed the South African government for its “primitive labour laws”, which create conflict between unions and workers due to a ‘winner-takes-all’ relationship between stakeholders. Seven environmental incidents concerning the Marikana mine and its waste took place in 2018. On 26 February 2018, some 4,000 tons of slurry from a bulk talkings treatment pipeline spilled into the surrounding area in Marikana, including into a river. Answering the question of how the British-South African company will ensure these incidents do not happen again, Beamish said: “We’re a responsible operator, we do not contaminate the environment at all if we can help it’. Many shareholders were unhappy with the questions from the solidarity alliance, with one telling the board and the alliance that they should “have a private meeting; we just want to find out about our shares”. Around 30 demonstrators gathered outside the venue, demanding justice for Marikana. 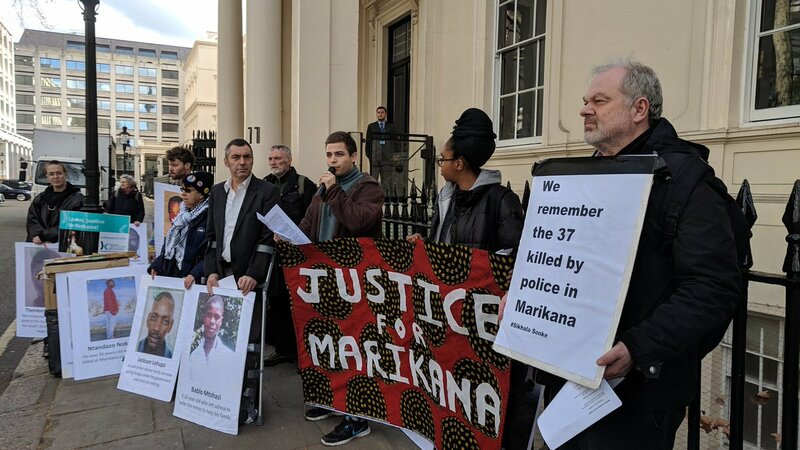 Those present spoke in solidarity with the community and on behalf of Marikana representatives Bishop Jo Seoka and lawyer Andries Nkome who didn’t receive their UK visas in time to attend the AGM. The names of the 34 murdered mine workers were read out. (1) On 16 August 2012, Lonmin called South African police forces to end a strike of miners at the Marikana platinum mine. The police killed 34 miners and injured more than 70 at an incident which is known as the Marikana Massacre. Since the massacre, Lonmin has been accused of complicity in processes of intimidation, criminalisation and incarceration of miners and their families, with many still imprisoned for their actions during the strike while impunity reigns for the corporation’s executives despite the allegations against them. (2)The Social Labour Plan was agreed in 2006, in which Lonmin outlined its plan to develop the community of Marikana, including building 5,500 houses for mineworkers and their families. Yesterday, Lonmin announced that it has now built around 1,149 homes, in 13 years. Lonmin’s primary customer is BASF, which buys 2 million euros’ worth of platinum every day, with a total share value of 60 billion euros. The world’s largest chemical company emerged out of the IG Farben conglomerate, an essential part of the Nazi war effort which created and supplied Zyklon B gas to exterminate over 6 million Jews, Roma, disabled and queer people, and had a private forced labour camp constructed next to Auschwitz which alone killed 25,000 people.